Net Weight: 2.2 oz. (per unit). Am glad to report that feedback to the first two ‘Uncle G’s Fun 420 Reviews’ has been very well received by the general public. So much so, here I am doing a third one. I mentioned in previous ‘Uncle G’s 420 Reviews’, the place I picked to be my medical marijuana dispensary is Verts Neighborhood Dispensary, in Fort Collins Colorado. Been going to them exclusively since getting my Colorado medical marijuana license, last year. In the process, I learned that Verts Neighborhood Dispensary knows cannabis. Every visit is a pleasure. I walk in, and they are always very nice to me. I’ll glance across the sales floor and usually see someone I know. We’ll exchange pleasantries from across the room. After check in, a one on one session with a knowledgeable salesperson so to get exactly what I came in for. I always leave a satisfied customer. Note: Results can/will vary. PLEASE/ALWAYS keep that in mind when doing edibles, or anything else marijuana related. For your own good. Learn all you can about it, before ingesting. Edibles should be fun, medicinal, or both. For those who are age 21 and over. Due to chronic pain. I’m either mildly discomforted, or screaming the majority of my waking hours. Nerve damage in part. Work hard … play harder. My body started wearing out in my 40’s. I mostly smoke pot now so to keep myself from popping opiates every day. I would do that if the pain dictated. Am only human. Can only tolerate so much without going off the deep end. Smoking pot also keeps me from drinking whiskey on a daily basis, something that I learned a long time ago, can be a wonderful pain killer. For myself and countless of others, getting drunk can be dangerous. So here I am. Doing edibles are very still relatively new to me. The upside is obvious; gives my throat and lungs a rest. Two thumbs up! Nice childproof packaging. In today’s world, it has to be. The box is very informative concerning the actual product. On its cover, it also has a cool image of the legendary rock guitarist; Jimi Hendrix. Hard to believe that he passed away almost 50 years ago. If I was a tad older, I could have maybe witnessed first hand, the musical genius this man possessed. On the product’s website is more detailed information (Hendrix Press Release) about how it’s namesake and the edible product(s) joined forces. I, of course, dig the late Jimi Hendrix, and the classic rock connection to cannabis. Nowadays I write music/movie reviews for a 24/7 classic rock station that comes out of the UK. Doing this for 5 years now. Tempus Fugit. An enjoyable experience. I thank its fearless leader Jon Kirkman for inviting me aboard. Regarding my writing, I certainly cut myself a niche since I first appeared on the world wide web, back in the mid-1990’s. Remember AOL and Yahoo Groups? Weird at first learning I had people who dug my writing. Always flattering. I am hoping now that those into ‘cannabis’, keep up and follow me on this new 420 journey as I explore everything legal marijuana in the twenty-first century has to offer. Plus I’ll try to entertain with a good story or two. Keep reading. So far … doing well. I always enjoyed the side effect cannabis has in regards to getting high/stoned. It wasn’t until years later when I started learning how ‘pot’ could help me with certain ailments/afflictions. Two hits of a good indica at night before my head hits the pillow, and I snooze until it’s bathroom time. Us older guys, we’re up once or multiple times a sleep cycle. The only way a human skips the aging cycle is, dying. I’m not complaining. I dosed with ‘Jimi’s Cannabis Collection_Stand Next To My S’mores (Indica 30 mg) FOUR times, over the course of four different days. Not consecutive. I skipped a day after the second try, to help gather my thoughts so far. One box contains ten doses. Again, this is found on the medical side. There is a different/somewhat weaker version that sells on the recreational side. I did not mix this edible with anything else while under its influence. Knowing my own body, I felt safe when conducting the following ‘sampling’ of this cannabis product. My first go at it, I waited until night so the Sativa cannabis I smoked earlier that day, would leave my system. I consumed my first S’more at around 10 pm on a Friday night. The day was a long but good one. Included a trip to the Verts Neighborhood Dispensary. This is where I learned about the edible I am now writing about. What struck my curiosity was in itself that word of mouth was good. Figured I’d find out for myself. Taste wise the S’more was yummy! I previously had in my life, edibles that tasted like dirt, or what I thought the planet would taste like. Not that I ever got a knife and fork, went outside in the backyard, and started dining on it. I enjoyed the effects the home-made edibles offered but hated actually eating the damn things. At least the ones I ran into. But fear no more. 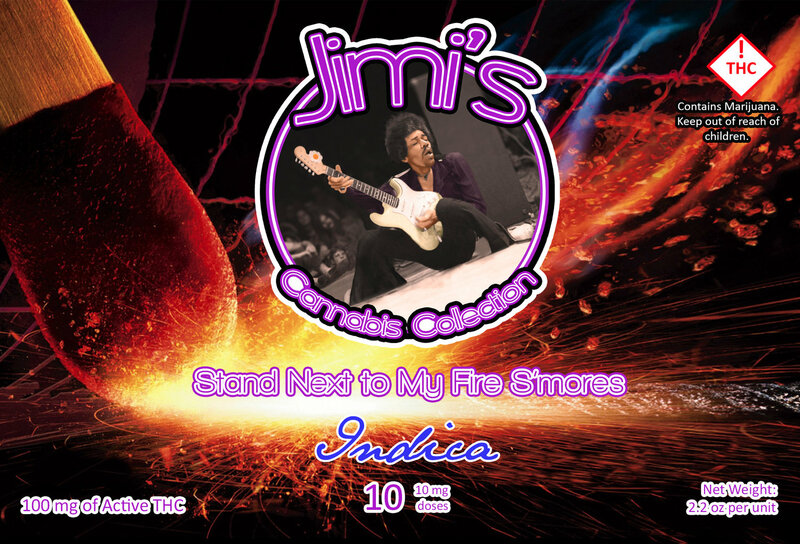 With Jimi’s Cannabis Collection – Stand Next To My Fire S’mores, there is no earthy taste unless you keep it in your mouth, holding it to the roof with your tongue until you think it’s going to dissolve like it’s blotter acid from back in the 1970’s. The way edibles hit the brain first is through the liver. In review, a different THC delivery system than smoking. Easy enough to do if an adult in their right mind (suggested), 21 years of age or older; stick in mouth, chew like any other bakery treat, enjoy the taste, swallow, and then wait. It accounts the size and shape of the individual, as to when it hits, and how long it last. Typically several hours. I dosed again at 11 pm after first starting to feel the first one. Was wanting to crash. Fell asleep watching cable news. Slept great! The next day I ate my first, Stand Next To My Fire S’mores, after dinner. A lovely dessert I thought to myself. Followed up about 45 minutes later with another. Spent the rest of the evening watching Netflix. Two days later I did three doses again starting in the early evening. The next night I did the same thing. Never left the house. I noted my pains were minimal. Nice continuous buzz. Caught some great z’s. What’s not to like? Uncle G’s Verdict: Wonderful product worthy of the name.